Hi all, I've joined a blog linky party called Antipodean Beauty. Created by Omega this is a makeup challenge group for Aussies and Kiwis where we post makeup looks depending on what that week's theme is. Even though it's a weekly link party, I'll probably not be able to manage every week but will join in whenever I can. Anyway, enough chit chat. This week's theme is... My Favourite Lipstick! Long time readers of my blog will know how much I adore MAC Impassioned, it is my favourite lipstick. However since I've blogged about it a billion times before (just do a search for Impassioned using the search box on the right, you'll see how many posts come up!) today I will be showing you my second favourite lipstick which truth be told I wear way more than Impassioned. It is Corrupt by Illamasqua, and it's the most flattering shade of warm candy pink. All Illamasqua lipsticks are extremely matte, and this is no exception, so a lipbalm is essential. I actually didn't wear lip balm in the pic below (was feeling lazy) and you can see how dry it looks on the lips... but never mind that, with a colour this pretty surely you can forgive its one sin? I normally wear this lippy with a sleek black eyeliner and a warm pink blush to match. So now if you'd like to see what the other members' favourite lipsticks are just check out the links below. I love Corrupt by Illamasqua, it's also one of my all time favourite lipsticks! I actually have a feeling Corrupt has been discontinued.... Noooooo.... so need to stock up on it when I next see it. What?! Why would they do this?! I like the color. It's so bright, but perfect for a punchy look. I have this in my collection, though it's been fairly unloved recently as there have been so many awesome drugstore lip products that have come out. Will have to fish it out and start using it again! I was soooo sure you would pick Impassioned! Lilit, gorgeous colour on you it is so nice to see another strong lip colour lover!!!! Haha, I saw on your blog that you'd named Impassioned your favourite! Great minds think alike! But yeah, I'm quite happy with this Illamasqua one too! 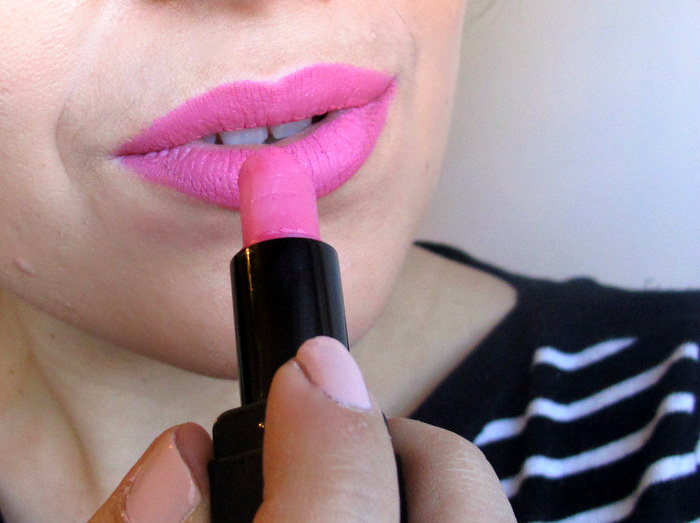 I love looking at others wearing candy pink shades because I can't seem to carry that colour well and I think Illamasqua's lipsticks are just AMAZING! You look gorgeous in that colour Lilit!